As Perma's most effective stripper, Eliminator rapidly dissolves multiple layers of floor finish, allowing, in some applications, for removal without the use of floor machines or stripping pads. Formulated almost completely from top quality water miscible solvents, contains less than 1% solids at concentration, leaving no alkaline residue to adversely affect subsequent finish applications. 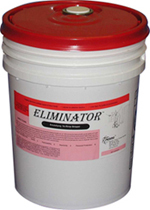 No other stripper can surpass Eliminator for the removal of heavy build-ups of today's UHS and urethane fortified finishes. Years of buildup can be quickly and easily removed by light agitation with a scrubbing machine and standard stripping pad. Will even dissolve the almost impossible to remove straight acrylic sealers. Formulated for those floor care professionals whose time is at a premium.